I seem to be putting pumpkin puree in everything lately. How about you? 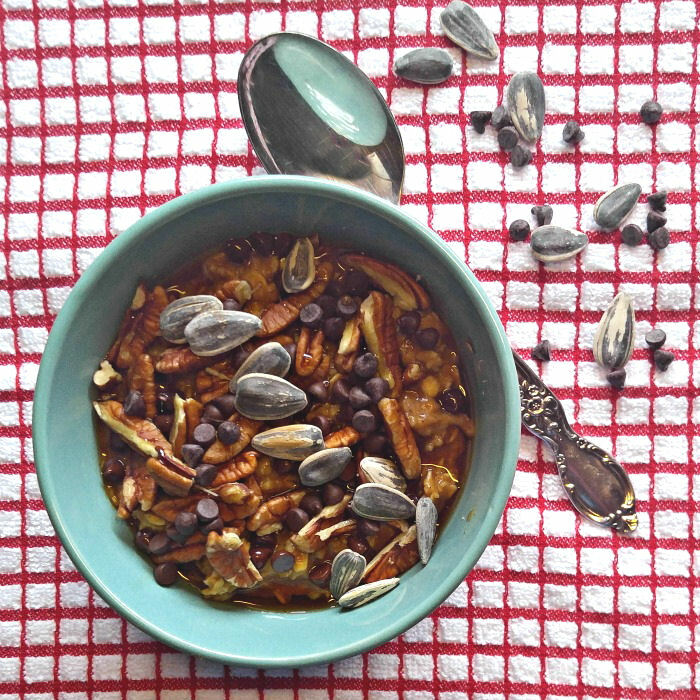 It seems that, for foodies, this time of the year could aptly be called “pumpkin season.” Today’s offering is a pumpkin spice oatmeal bowl that is hearty, satisfying and full of the flavors of fall. I love using pumpkin puree. It has a lovely earthy taste that goes great with so many other foods. I’ve made pumpkin chili, no bake pumpkin spice cookies, and even pumpkin Mummy truffles! And that is just in the last few weeks! Since I have main course, snack and desserts covered, I thought it was time to try my pumpkin puree in a breakfast recipe. Making my pumpkin spice oatmeal. Getting out the door in a hurry AND having a good for you breakfast don’t have to be mutually exclusive. Don’t just grab a muffin and run. This hearty and tasty breakfast is made in less than 10 minutes and gives a great dose of vitamins and minerals in a heart healthy way. Start by combining your old fashioned oats and skim milk in a saucepan over a medium heat. (almond milk also works fine and makes the recipe dairy free!) Bring the mixture to a boil and then simmer until it gets nice and thick. In go the pumpkin puree, vanilla extract, cinnamon, sea salt and nutmeg, and the mixture is stirred until it is heated through which only takes about a minute more. Add 2 tablespoons of maple syrup and stir well and your breakfast is ready! Can you believe how quick that was? You could eat it right now of course, but let’s make this pumpkin spice oatmeal bowl even more flavorful with some delicious toppings! I topped mine with some chopped pecans, a sprinkle of crunchy sunflower seeds, and a few Enjoy Life mini chocolate chips (cause why not?) A drizzle of some more pure maple syrup gets added and we are done. I love to use maple syrup instead of refined sugar because I don’t get the sugar high (and low that follows) by using it. How does this pumpkin spice oatmeal taste? In a word – A-MAY-ZING. Well, that looks like three almost words, but it gets the point across, right? 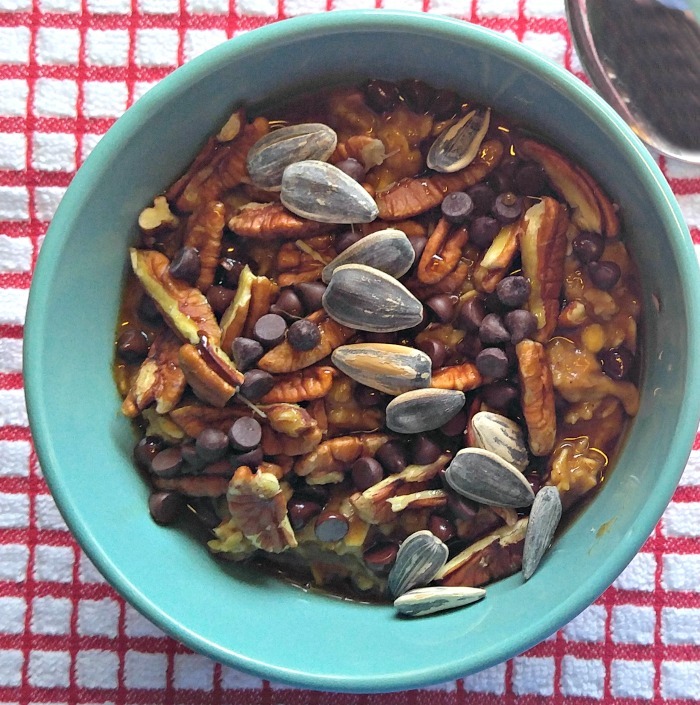 The oatmeal has an earthiness that comes from the pumpkin puree and adding the nuts and sunflower seeds gives it a nice crunch. And the maple syrup and mini chocolate chips? The chocolate melts slightly as you eat the oatmeal giving it a nice richness with every bite. You’ll feel almost as though you just had chocolate crumble pumpkin pie for breakfast! 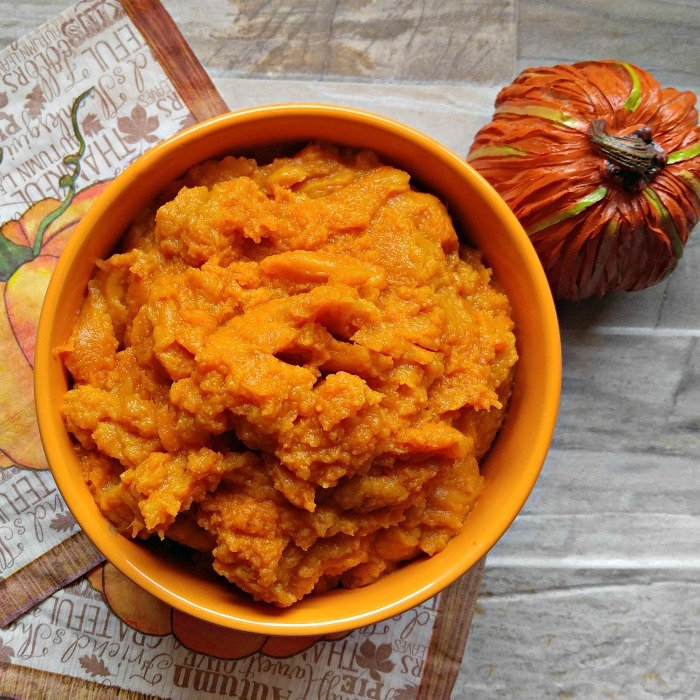 My family (even my non pumpkin eating husband) asks me to make this again and again. And I don’t mind one bit, since it’s ready in a flash. 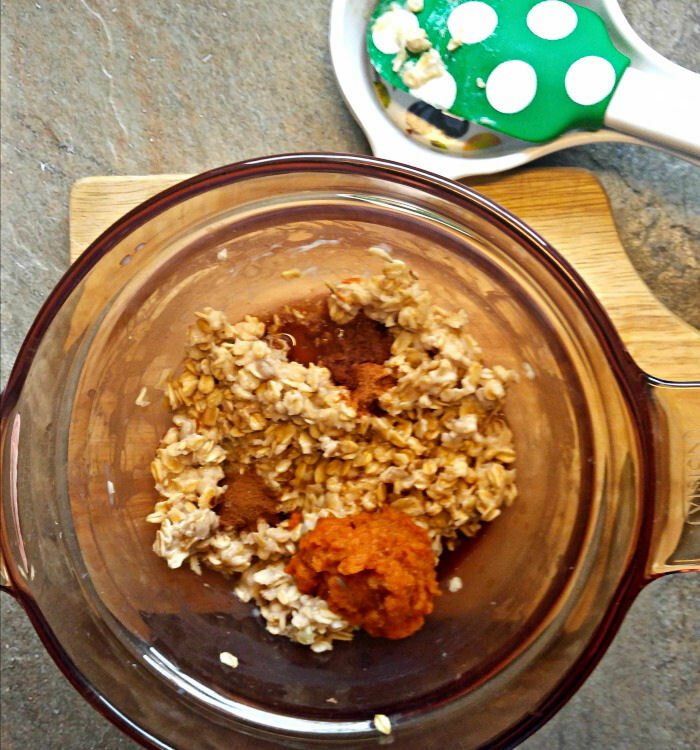 This pumpkin spice oatmeal recipe is gluten free, healthy and super filling. Make some today. See? Pumpkin is perfectly acceptable as a breakfast offering. It makes an already healthy breakfast take on an extra dose of veggie goodness. Fast, easy and SUPER TASTY! 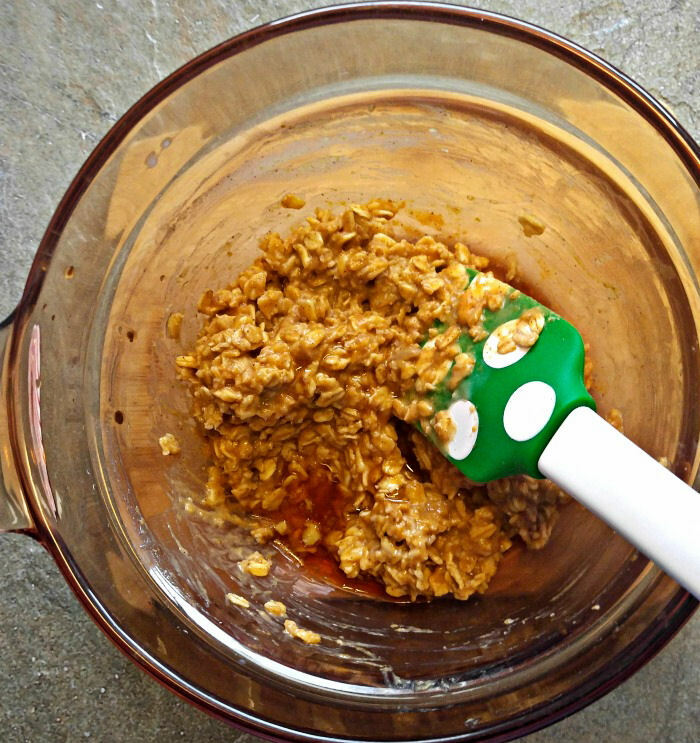 This pumpkin spice oatmeal recipe is super fast and easy. It is healthy and satisfying and comes together in just minutes. 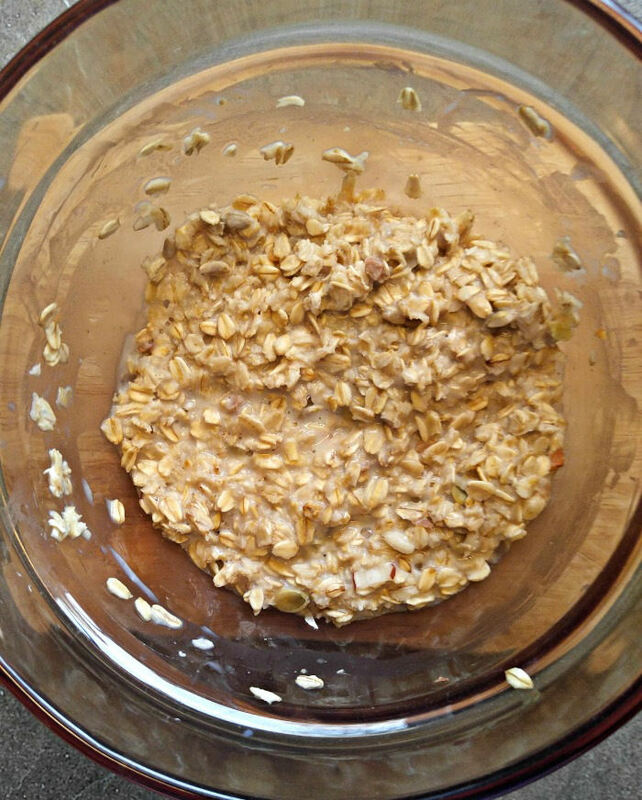 Combine the rolled oats and skim milk in a small saucepan over medium heat. Bring the mixture to a boil; then reduce the heat and simmer, stirring occasionally, until it gets to your desired consistency, about 3-5 minutes. Stir in the pumpkin puree, vanilla extract, cinnamon, sea salt and nutmeg until the mixture is heated through, about 1 minute more. Add 2 tbsp of maple syrup and stir well. 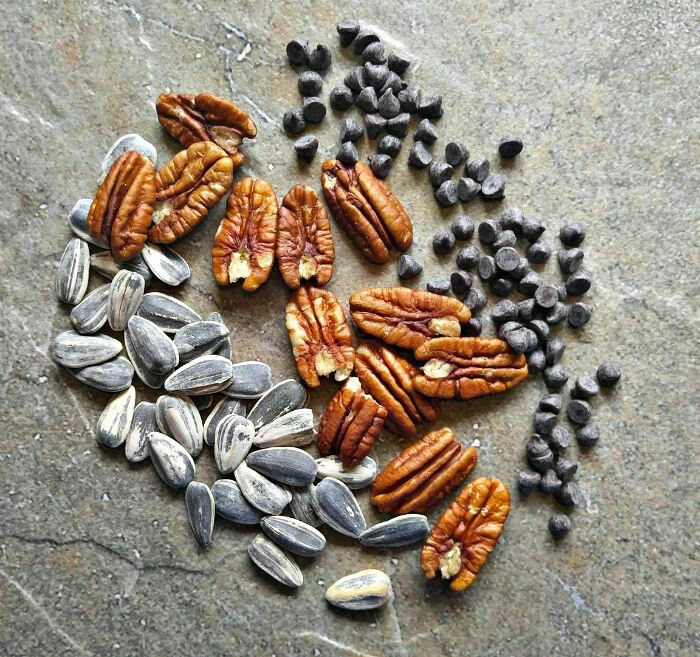 Serve immediately, garnished with chopped pecans, Enjoy Life chocolate chips, a few pumpkin seeds, and extra maple syrup.